Did you know that Universal Pictures Despicable Me has inspired an actual color called Minion Yellow? PANTONE Minion Yellow is an illuminating, energetic, friendly and fun-loving yellow shade that immediately calls out to you. The executive director of the Pantone Color Institute Leatrice Eiseman (Director of PCI; not the director of the movie) stated, "Just as the sun’s rays enliven us, PANTONE Minion Yellow is a color that heightens awareness and creates clarity, lighting the way to the intelligence, originality and the resourcefulness of an open mind – this is the color of hope, joy and optimism." The partnership was born when Pharrell Williams, who helped create the music for the Despicable Me franchise, came up with the idea while the Pantone Color Institute, the research arm of the company that charts global color trends and studies how color influences human thought processes, emotions and physical reactions, noted the desire of the consumer to add more energizing color into their lives. Pantone worked closely with the animation team at Illumination Entertainment to review the existing color range and to identify the most pure representation of the Minions’ iconic yellow color. The resulting PANTONE Minion Yellow is a custom color designed to represent the sweet and subversive characters. An extroverted hue, it projects playfulness and warmth and is suggestive of intellectual curiosity and enlightenment. Illumination Entertainment is an American animation film production company, founded by Chris Meledandri in 2007. It has an exclusive financing and distribution partnership with Universal Studios and it is based in Santa Monica, California. The company is best known for its first animated feature film Despicable Me (released in 2010), its sequel, Despicable Me 2 (2013) and its prequel/spin-off Minions (2015). 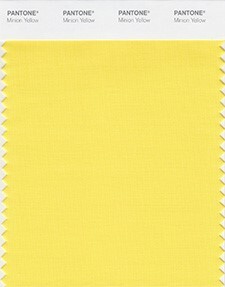 The custom PANTONE Minion Yellow color will be added to the PANTONE Fashion, Home + Interiors color palette. Thank you for taking the time to read our fashion color trend blog post. We hope that you have found this news to be informative. Learn more about fabric color swatches here on Apparel Search.